This is the area for bespoke containment devices or enclosure systems. Bespoke containment enclosure systems by CTS / A1 are designed to provide a safe and climatically controlled environment for the handling of sensitive drug compounds and pharmaceutical testing procedures. We have many years of experience in the Pharmaceutical industry and understand our customers’ requirements. We are able to offer Consultancy, Design, Production, Installation, Commissioning, IQOQ, Service and Training for all our products. Our aim is to lead the industry with containment solutions that help Hygienists provide safe working environments allowing analysts to carry out their work effectively. Prolyse BV can offer service and maintenance packages on all our containment systems to suit our customers’ needs. All equipment is pre-qualified prior to shipment. In nearly all cases we provide IQOQ packages with our equipment to ensure that the systems are installed perform to our customer’s expectation. 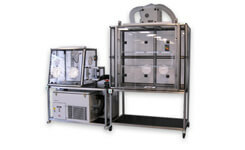 We have many years experience in the Pharmaceutical industry working on many different containment applications. We are keen to work with customers to develop solutions which fit into their sample handling processes to make them safer. We can design and produce small portable containment devices and also larger scale containment solutions dependent on the application requirement. Where required we can also arrange for independent testing of our devices to ensure that they perform to customer specification. Very often laboratories are required to carry out more than one analysis or manipulation on the same sample. This can mean that the sample is moved to different locations within the laboratory which will mean it leaves the contained environment of the enclosure in which it is tested. The approach of a complete contained process means that a sample can be transferred to various containment devices safely and that all aspects of the sample handling are contained. CTS / A1 can design and supply containment devices and also work with customers to engineer safe laboratory processes by linking containment systems and equipment together, providing a complete contained laboratory process. CTS / A1 specialise in designing containment solutions for the laboratory environment, we can work with customers to understand their safety applications and work through the design process with the client to develop a containment solution. We have specialised engineering design and modelling packages that will allow us to speed up the enclosure design process and identify the containment device design very clearly. This allows the customer to have as much or as little involvement into the design of the device as they wish. Would you like to request a quote or more information? © 2010-2017 Prolyse BV, all rights reserved.